Moscow is the capital of Russia, so it’s no surprise that it’s the country’s main intellectual, cultural, and business hub. Known by locals as The First Throne, the city will also serve as the grandstand for the Moscow Affiliate Conference 2019, and PropellerAds is making preparations to make a big appearance at this exciting event. The MAC promises to unite the top affiliates and leading networks from all around the world in one place. Let’s go over the Moscow Affiliate Conference 2019 and what PropellerAds will bring to the event in this year’s edition. The MAC is a two-day event that features more than 3,000 attendees, exhibition zones, networking areas, expert panel discussions, and the opportunity to rub elbows with some to the most influential affiliates and partners out there. What’s more, the event will feature a roster of 30 seasoned speakers that will be sharing their expertise on stage. More than 250 companies from dozens of different countries will be showcasing their platform’s tools as well as their features, and PropellerAds is no exception! 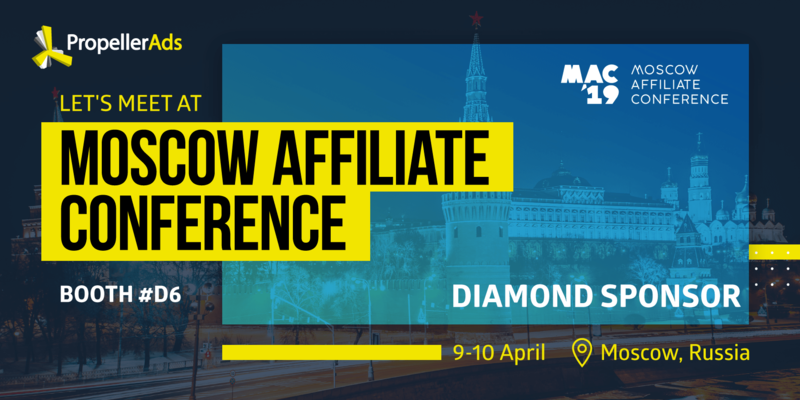 The Moscow Affiliate Conference 2019 will take place on the 9th and 10th of April, but there will be a pre-party on the night of the 8th to set the mood for the event. The conference will take place in one of Moscow’s newest venues, known simply as Main Stage, followed by an amazing after party that promises to be as memorable as the presentations themselves. PropellerAds will be in Booth D6, so make sure you book an appointment with us and make sure you get a chance to meet our team. Although we’re used to attending the biggest affiliate events on the calendar, we are especially excited to announce our participation the MAC 2019. PropellerAds is one of the event’s diamond sponsors and we’re bringing some of the hottest enhancements we’ve released up to date. Native ads are taking the affiliate world by storm, so our team of experts will show you how to leverage their power at the MAC 2019. And, you’ll also pick up a few tips on how to create winning content for this exciting ad format. As a leading network, we’re always making improvements that help bolster your campaigns. This year, we’ll discuss our newest features, which include new rotation algorithms and traffic tokens for push notifications, time zone targeting, as well as premium options that allow you to opt for creme-de-la-creme traffic with impressive CTRs. Along with Alfaleads, PropellerAds is proud to present our own sponsoring party on April 9! We’ve decided to go all out and host a party for our top affiliates with a – wait for it – Japanese cyberpunk theme! There’s a limited number of passes available, so make sure you contact us today and sign up for one of the hottest celebrations at the MAC 2019. For this year’s conference, we’ve put together a team of our best representatives. Our team will be in Booth D6 and they’ll be glad to answer any questions you have about PropellerAds and the affiliate world in general. Anton has years of experience in the industry and he’s the head of our Affiliate Club. In the past, Anton has attended affiliate events as a speaker and he’ll be happy to share valuable industry insights as well as new information about our exciting releases. Ariadna is our Business Development Manager and she’s a fountain of information when it comes to anything affiliate marketing-related. She’ll be at the MAC and gladly answer any questions about the industry in general or about our innovative platform. Eugine plays a major role at PropellerAds and he’s in charge of building our most important business relationships. Aside from having hand-on-expertise, he’s also extremely knowledgable when it comes to creating long-term, profitable relationships with your most important providers. All in all, the Moscow Affiliate Conference promises to be one of the hottest events in the industry’s 2019 calendar. Contact us to book an appointment today and make sure you get a chance to talk to our representatives at Booth D6 on the day of the event! Jackpot: PropellerAds is Heading to the Affiliate Summit West 2019!